Do exchange rate regimes matter for the formation of countries’ external imbalances? Economists have thought so for over sixty years, and policymakers have made countless recommendations based on that presumption. But this had not been tested empirically until very recently, so it remained an opinion rather than a fact. In this post I show that having a flexible exchange rate regime leads to the correction of external imbalances in developing countries, offering some empirical support to a widely held belief. In contrast, this does not seem to be the case for advanced economies. The debate on the link between exchange rate regimes and external imbalances has been brought back into the frontline by a rise in the so-called “global imbalances” (Fig. 1). However, its origins can be traced more than sixty years back. It was Friedman who put forward the hypothesis that having a flexible exchange rate tends to produce corrective movements in a country’s current account (CA), limiting the accumulation of external imbalances. Friedman’s idea was that as a, say, CA deficit developed, the exchange rate would tend to depreciate, boosting exports and reducing imports, and hence correcting the incipient deficit. In contrast, this wouldn’t happen under a fixed exchange rate regime. Friedman’s hypothesis has since been considered part of the “conventional wisdom” in academic and policymaking circles. In fact, it has been used numerous times as the basis for giving policy advice to countries displaying significant CA imbalances. Given this popularity, it is quite surprising that Friedman’s idea had not been tested empirically until recently. Beginning with Chinn and Wei (blog post here), a series of papers has to take this hypothesis to the data, finding mixed results that do not seem too supportive of Friedman’s original claim. 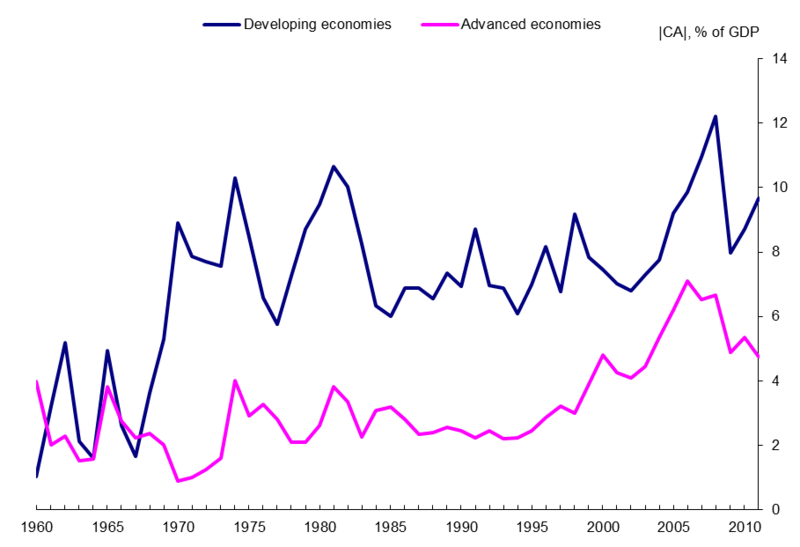 In particular, Chinn and Wei (2013) study the dynamics of the current account under different exchange rate regimes. They test whether the CA reverts faster to its long-run or “equilibrium” balance when countries are under flexible exchange rate arrangements than under fixed alternatives. This is their measure of adjustment, so if having a flexible exchange rate prompts a faster mean-reversion of the CA, then it’s considered to help correct external imbalances. The results they obtain do not display a clear-cut effect, as the difference across regimes is never too big, and it sometimes points in the “wrong” direction. These findings lead the authors to label Friedman’s hypothesis as a “faith-based initiative”. Ghosh et al. also study the dynamics of the current account across exchange rate regimes, and provide a new insight: when splitting the sample into CA deficits and surpluses, and accounting separately for large and moderate balances, they find that fixed exchange rate regimes only deliver a faster adjustment in the case of large deficits. In the rest of the cases, it’s typically the floating alternative that is associated with a faster CA mean reversion, in line with Friedman’s hypothesis. Interestingly, the authors also document that “sudden stop” episodes are more common under fixed exchange rate regimes. These episodes are instances in which there is an abrupt drain in a country’s foreign funding. Given that current account deficits tend to be financed by foreign funding, they tend to reverse during or after sudden stops, typically with large costs for a country in terms of output. 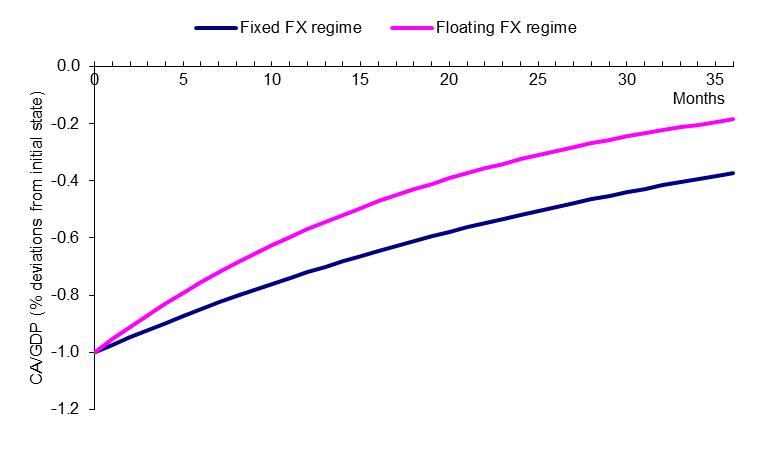 A way to reconcile the findings described above is the following: floating exchange rate regimes might typically deliver a faster current account adjustment than fixed alternatives, except in the case of sudden stops episodes. These episodes, which tend to be more frequent under fixed regimes, result in an abrupt adjustment of the current account, which could blur general comparisons such as the one in Chinn and Wei (2013). However, these adjustments, typically associated with crisis, are definitely not the type of smooth and benign adjustment sought for when giving policy advice. So we want to leave them out to get more accurate and useful comparisons. In a recent paper (JIMF, forthcoming) I compare the speed of current account adjustment across exchange rate regimes appropriately by explicitly accounting for the occurrence of sudden stops. In order to do so, I first identify sudden stop episodes as cases of sizeable capital outflows (in relation to a country’s GDP and to its capital flows’ own history) which are preceded by inflows in the previous period. Once sudden stop episodes are identified, I incorporate this information in the estimation of the speed at which current account balances adjust across different exchange rate arrangements. Following the cited papers, “adjustment” refers to a reversion towards a long run or “equilibrium” current account balance. The speed of this process is measured by the size of the coefficient of mean-reversion of an auto-regressive equation. I consider two alternative measures of the long-run or “equilibrium” balance of the current account. In the benchmark specification, this is simply a country-specific average. Alternatively, I model this “equilibrium” or long-run current account balance as a function of relevant observable factors such as demographic variables, GDP per capita and others. When estimating this specification using a panel of 180 countries over 1960-2010, I find robust evidence that flexible exchange rates deliver a faster current account adjustment among developing countries. In contrast, for advanced economies the speeds of mean reversion are not significantly different across regimes. When calling the results “robust” I really mean it: I re-do the estimation using different exchange rate regime classifications, dropping outliers, accounting for unobservable shocks and considering a range of estimating techniques. My main results hold throughout. The lack of an effect in the advanced economies sub-sample is interesting. One possibility is that there exist “non-linearities” in the link between current account imbalances and exchange rate dynamics. That is, it might be the case that flexible exchange rates adjust, prompting a correction of current account imbalances, only when these imbalances surpass a certain threshold. Given that advanced economies’ current account balances tend to be smaller than emerging economies’ in absolute value, maybe it’s not possible to identify the referred link from their data. Focusing on developing countries, the difference in the speed of adjustment of the current account across exchange rate regimes is not only significant statistically, but also large in an economic sense. A way to quantify this is by using what economists call the “half-life” of a shock; that is, the time it takes for a given shock (disturbance to an initial CA value) to dissipate by half. While specific figures should not be taken at face value as they depend on the particular exchange rate classification used, Fig. 2 shows that while the half-life of a shock to the current account is approximately 25 months under a fixed exchange rate, this almost halves to approximately 14 months in the case of a floating regime. That is, current account imbalances correct much faster under floating exchange rate regimes. The usual recommendation to adopt more flexible exchange rate regimes given to countries experiencing significant current account imbalances remained a “faith-based initiative” for more than sixty years. However, more recently there have been efforts to take this faith to the discipline of data. I show that, when appropriately accounting for the occurrence of capital “sudden stop” episodes, flexible exchange rates do deliver a faster adjustment of the current account for developing countries. After all, the data seems to verify the intuition put forward by Freidman more than sixty years ago. Fernando Eguren-Martin works in the Bank’s Global Spillovers and Interconnections Division. Next Post Shocks Happen: Are Retail Deposits the Answer?